One of the old Veta Pass narrow gauge engines is expected over next week to be used on the Bald Mountain Railway. One locomotive has been found inadequate to haul all the cars and keep the coal away from the mine. With more transportation facilities work will go on a pace. The Occidental Development Company chartered the Bald Mountain Railway in 1903 (note there are two other Bald Mountain RRs in USA, one logging line in Maine, and one mine line with Shay engines in California.) This line has been hiked and explored by Tony Manthos and mapped out to 3 miles and 3300’ and very few ties are still remaining but most R/W is evident. The line is on private property and restricted. Only a sketch is known showing the tripple next to the San Juan & Rio Grande Railroad grade west of La Veta, on the route over the summit at Fir. The Tipple was near MP 197.3 and the high curved trestle in the photo is below MP 199.0. The Occidental Mine was opened by a cross-cut tunnel, 308 feet from the west, through beds of Marine Cretaceous shales and sandstone. The seam of coal was from 6 to 12 feet thick standing nearly vertical, and 60 feet further, another seam of 4 feet thick coal is encountered. Four seams in all are known to exist on this property ranging from 4 to 12 feet in thickness. 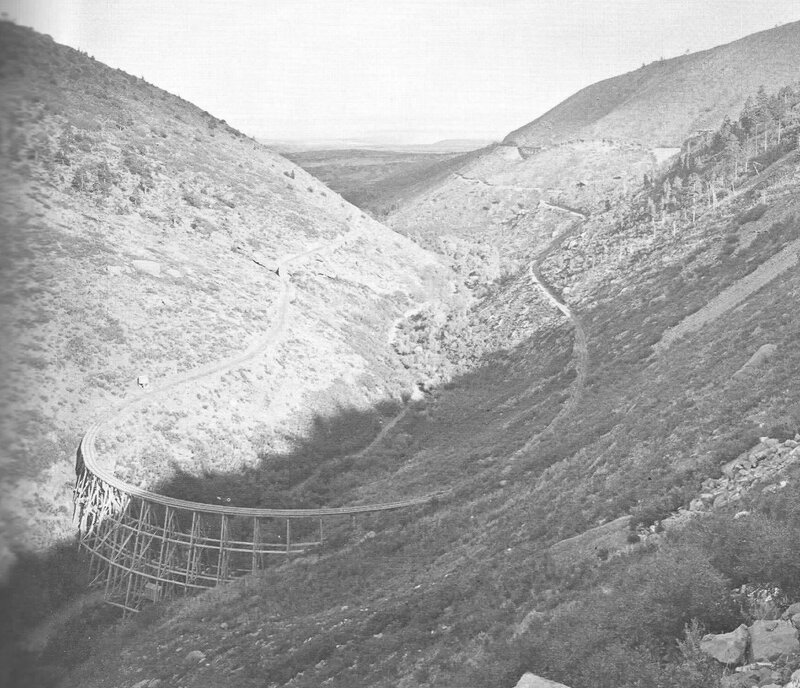 Owing to the steepness of the hillsides in the vicinity and to the fact that the Denver & Rio Grande Railroad passes about a mile from the mine, on a high-line grade on its way into the Sangre de Cristo Range, it was found necessary to connect the mine with this railway by a narrow gauge high-line grade of 3 ¼ miles. This piece of engineering was successfully carried out by Mr. A. A. Foote, the engineer. The line reaches many lofty trestles. The roadbed has been constructed 12 feet wide, blasted out of solid rock for over one-half of the distance. The thirteen bridges range from 10 to 92 feet in height. The triple at the south end of the line is 675 feet long and 40 feet high with a 3% grade on the north approach. Sufficient room is provided to handle 70 mine cars at any one time. The equipment of the road consists of one H.K. Porter No. 2884, a 0-4-0T build August 1903 (7”x 12” cylinders) as #1, about 100 eight-feet cars carrying 2 tons of run-of-mine coal, three water tanks, one at each end, of 2,000 gallons capacity and a mine tank of 6,000 gallons. In 1905 it was reported the Occidental Coal Mine would be operated during the ensuing year by the Great Western Fuel Co., of Denver.